Residents of the Republic of Ireland driving on UK licences will not be able to do so if there is a no-deal Brexit. Advice issued by the Republic's driving licence authority is for motorists to exchange their permits ahead of the UK's exit from the EU on 29 March. 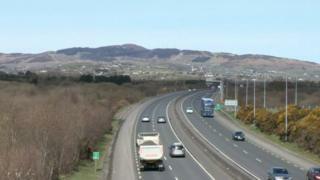 Drivers from Northern Ireland who drive in the Republic will not be impacted. The Irish Road Safety Authority (RSA) said UK licences held by those resident in the Republic will "not be recognised" after a no-deal Brexit. In its statement, the RSA said holders of UK licences will "not be able to continue to drive here in Ireland on that licence". It does not impact on drivers from the Republic in the UK, as the government has indicated it will continue to recognise EU driving licences after Brexit. The prompt from the Irish licensing authority for drivers to make the exchange is echoed by the Department for Transport. It has advised motorists currently driving on UK driving licences across the EU to exchange their licences "as soon as possible", as otherwise they may be required to pass a test to continue driving after 29 March. Under current arrangements, UK licence holders are entitled make an exchange for an Irish licence, with the process taking up to 10 days. The RSA has warned there could be delays to the turnaround time as demand builds ahead of Brexit. If the UK leaves the EU with a deal, UK licence holders in the Republic will have until the end of the transition period in December 2020 to exchange their licences. There had been earlier confusion about the documentation needed by motorists travelling in the Republic of Ireland in the event of a no-deal Brexit. Last September, the UK government advised that an International Driving Permit would be required to drive in the Republic after 28 March 2019. But in January of this year, that advice was withdrawn. Now updated advice states that you should not need an international permit to drive south of the border. Despite this, some post offices have started selling the permits to customers keen to ensure that they can continue driving in the Republic of Ireland after Brexit Day. In the event of a no-deal Brexit, drivers will require a green card which proves their insurance covers them in the Republic.